In the lower right corner of your screen will be your stamina meter. When the meter is completely green you have 100% of your stamina. As you work on your farm the actions will decrease your stamina bar. If you run out of green then you pass out until the next day! You can recharge your stamina by going to bed and eating food. If you go to bed too late in the evening there's always the chance that the night's rest won't completely refill your bar. To increase the overall stamina that you have, you will need to locate Power Berries. There are 5 berries you can collect. Each time you eat one your stamina will increase by 20%, so you can eventually double the amount of stamina you had at the beginning of the game. Win the Beach Festival on Summer 03. This requires you to swim around and touch the different colored balls floating in the water. If you can get all 4 before Jamie gets them you'll be the winner. If it's your first time winning the reward is the berry. Collect 30 Music Notes and return them to the Sprites at the Goddess Spring. After the groups of 5 notes have turned into musical instruments the Sprite will give you a berry for all of your hard work so far. You still need 20 more in order to free the Goddess though! During the Spring and Fall seasons a horse race will take place in the village. The Carpenter's W.S. Cup has a grand prize Power Berry if you win. You can only enter that race if you're horse has the required heart marks. The Moonlight Mine behind Jamie's Ranch is where you can go to dig for ores, clay, Pontata Root, and jewels. The mine is 100 floors deep and you have to get lucky enough to fall through the right crack in the floor to descend down. If you reach the 100th floor of the mine, Tim will give you a berry. On Fall 30 there is a Pumpkin Festival that takes place in Rose Square. On the 29th of Fall you must donate a Pumpkin to the blue shipping box inside the plaza. 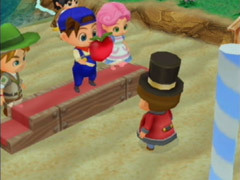 The next day when you visit Mayor Theodore will thank you for your participation and give you a Power Berry to eat.